When I’m packing for a trip to Tokyo, the first book into the suitcase is my battered copy of the Kodansha bilingual Tokyo City Atlas. It has saved the day from my pidgin Japanese and poor spatial skills on numerous occasions. But I usually know where I want to go in Tokyo. What if you don’t? What if you’re making your first trip, spending a large amount of currency on a long flight to the land of your dreams, in need of some help to make sure those dreams come true? Reach for this book and your worries are (almost) over. Longtime Tokyo resident and fellow-otaku Gianni Simone has distilled his experience of living in the city of anime dreams into 144 pages packed with photos, maps, addresses, tips and information. Simone starts with a handful of rapid-fire articles on aspects of Tokyo’s geekdom, including a welcome look at Godzilla’s. He talks about manga, anime, toys, games, cosplay and idols, introducing a few big-name western and Japanese pundits and players. The pages are as easy to digest as a comic book thanks to the plethora of candy-coloured photos, and the nuggets of information in the text are easy to assimilate. A handy two-page map of Tokyo provides an opportunity to see how the city’s otaku areas relate to each other. Then it’s on to the main event – an area-by-area breakdown of otaku shops, galleries, museums, libraries, eateries, daytime and night-time hangouts and events, plus background information to make planning your visit easier. From the fannish pilgrimage hotspots of Akihabara and Nakano to less well-known areas like Koiwa and Hachioji, Simone has suggestions for what you must see and do, a guide to costs, and detailed descriptions of exactly how to get there. This is more important than you realise until you stand on a street where you can’t read either the language or the script it’s written in, and try to work out which way to go. Trust me, I’ve tried that. If you don’t have a local friend who can guide you in person, a book packed with almost 25 years’ experience of walking on the geek side is useful. I have only one quibble with the information in this book: the brief outline of cosplay history doesn’t reflect Japanese sources. Many Anglophone scholars believe that cosplay was exported from American SF cons back to Japan in the mid-1980s, despite Japanese sources locating it as early as 1974. But that’s a debate that doesn’t negate the usefulness of the book as a whole. As far as I’ve been able to check, the other background information presented in the book is accurate and Simone’s knowledge of the streets is spot on. I said your worries about your Tokyo trip are “almost” over when you’ve read this book: there’s more to Tokyo than fandom, and the Tokyo Geek’s Guide makes no attempt to address anything else. So you’ll need another guidebook. Simone’s achievement is to create a book that will save you so much time hunting for that special shop or café, you may actually manage to fit the Tokyo National Museum or the graves of the 47 Ronin into your schedule. Don’t forget, though, that cities are mutable. Leases end, buildings are demolished, clubs close down and prices rise. You’ll find that some of the information in the Tokyo Geek’s Guide is out of date by the time you visit. My first thought on closing this book was how useful I’d find a phone app version, quickly updateable and easier to carry around than a bulky paperback. But if you read the book before you leave, it will help you plan your trip, cover more ground and feel that little bit more like an insider in this perplexing and fascinating labyrinth of a city. Highly recommended for first-time visitors, it may also surprise regular Tokyo hands with a few places they’ve missed. 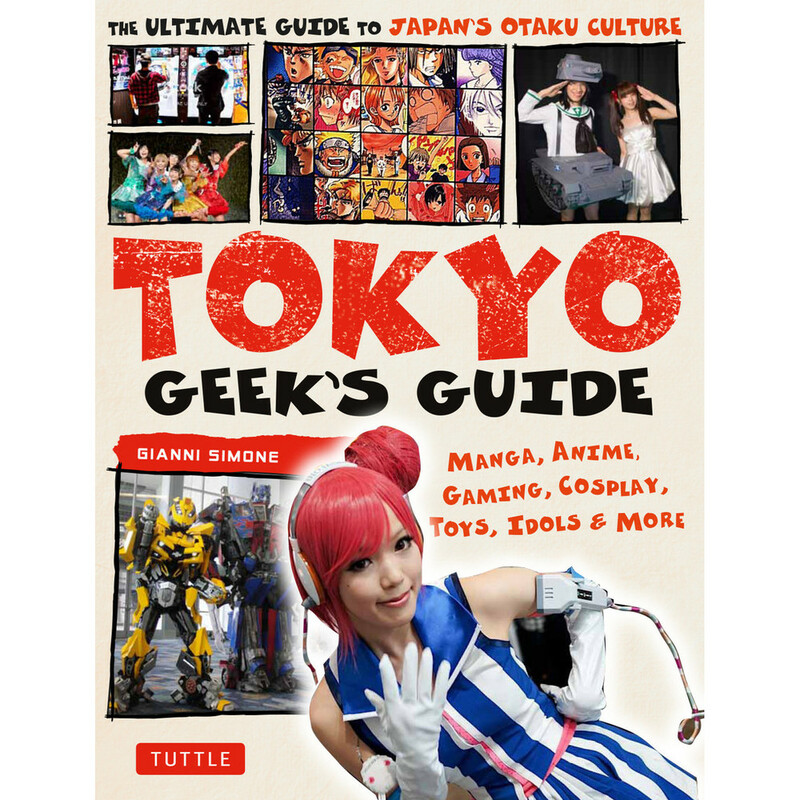 Tokyo Geek’s Guide is published by Tuttle.